Table runners are the allrounders in table décor. With very little effort you can create a stunning effect. 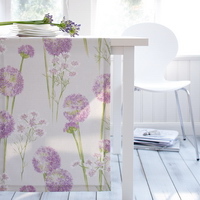 A table runner with an opulent pattern will lend a personal atmosphere in any neutral room. Use the table runners in many different ways: in the centre of the table, placed diagonally, in a smaller size than the table or generously hanging over. Or try them as a “tête à tête“ for two guests sitting across from each other.